Americans’ views of God shape attitudes on key issues – USATODAY.com: “Surveys say about nine out of 10 Americans believe in God, but the way we picture that God reveals our attitudes on economics, justice, social morality, war, natural disasters, science, politics, love and more, say Paul Froese and Christopher Bader, sociologists at Baylor University in Waco, Texas. Their new book, America’s Four Gods: What We Say About God — And What That Says About Us, examines our diverse visions of the Almighty and why they matter. Starting from such a concrete and existential concept of sin, the Orthodox tradition has refused to confine the whole of man’s relationship with God within a juridical, legal framework; it has refused to see sin as the individual transgression of a given impersonal code of behavior which simply produces psychological guilt. The God of the Church as known and proclaimed by Orthodox experience and tradition has never had anything to do with the God of the Roman juridical tradition, the God of Anselm and Abelard; He has never been thought of as a vengeful God who rules by fear, meting out punishments and torment for men” (Yannaras 1984:35). A Message from Metropolitan Jonah of the Orthodox Church in America. Read the whole thing here. Is it religious art? Is it something meant to make church buildings look beautiful? Is it a visual aid, used for teaching? In a sense ikons are all of these, but none of them captures the essence of what an ikon is. Perhaps it is easier to see what an ikon is if we look at what an ikon is not. Ad Orientem: What’s wrong with this picture? Yes. That’s an Orthodox bishop in a Romanian Orthodox Church. For the record, I have a rather high opinion of the late Pope. I am not unaware that he is widely regarded as a saint within the Roman Church. He may well be a saint. I don’t decide those things. But I do know one thing. Neither he nor George H. W. Bush (a true gentleman and a better than average president), nor Mikhail Gorbachev were or are Orthodox. Two of the three depicted in iconography are still alive and one is I believe an avowed atheist! Hat tip to Ken over at Hallowed Ground. At least one can say that the figures in the pictures don’t have haloes. That means they are not ikons, and one would not venerate them, even if they are in a church. Here is a slightly different example. Some years ago a colleague of mine in the Missiology Department at the University of South Africa, Klippies Kritzinger, showed me a postcard with a picture of Steve Biko, painted in an icon style, and asked me, as an Orthodox Christian, what I thought of it. He also showed me a similar one of Gandhi. Both of them came from Bridge-Building Images, and there are several others available from that source (hat-tip to Book Reviews and More: Robert Lentz’s Icons). My answer was that I did not regard them as ikons. First because neither Steve Biko nor Gandhi were Orthodox Christians (Gandhi wasn’t any kind of Christian). Secondly, because even if Steve Biko had been Orthodox, no Orthodox ikonographer would have painted him like that, with heavy prison bars in the background. If he had been Orthodox, and an ikon had been painted of him, then the prison bars would have been reduced, and he would probably have been showing either holding them, or with his hand resting upon them, to show that a martyr’s death is a triumphant one. This can be seen, for example, in ikons of St Catherine, who, it is said, was put to death on a wheel. 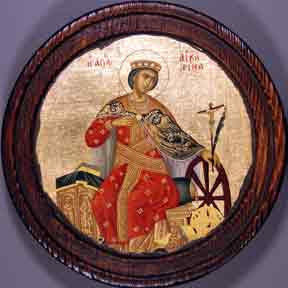 She is shown with her hand resting on a wheel, not with the wheel dominating the background. This is not to say that I don’t think Gandhi and Steve Biko were good men. On the tomb of St Alphege of Canterbury, who was boned (rather than stoned) to death by heathen Danes, is the inscription “He who dies for truth and justice dies for Christ”, and I think Gandhi and Steve Biko died for truth and justice, and the manner of Steve Biko’s death was similar to that of St Alphege. But that does not make the pictures of them Orthodox ikons. My blogging friend Matt Stone writes quite a lot about Christian art, and gives many examples, including some examples of ikons. But many of the works he shows I wouldn’t regard as ikons. In my own writing I usually distinguish between “ikons” and “icons”. Ikons with a “k” are Orthodox ikons, icons with c “c” are what you see and click on on your computer screen, or are celebs on steroids (often described as “iconic”). There is one more non-example of an ikon (or example of a non-ikon) that is perhaps worth mentioning. This one is supposed to be based on some famous painting, though I’m not sure which one. If anyone can tell me, I’ll be grateful. This too is not an ikon, but is rather a satire or parody of a religious picture, and is almost, in a sense a political cartoon. I’d say in belongs in the same genre as the pictures of the political figures in the Romanian Church, with the exception that those are admired, while this one is not. If you’d like to know where we saw it, and how we came across it, you can read the story here. See also Differences of Western religious art and Orthodox iconography. There seems to have been a lot of discussion in the blogosphere about the penal substitution theory of the atonement recently, so I thought I would throw in my 2c worth, when discussion on other topics seemed to turn to that. The trouble was that for more than a week I couldn’t remember the “p” word — my memory was turning into a forgettory, and I thought of “praeterist atonement” “praeternatural atonement”, and “preeminent atonement” but the phrase penal substitution seemed to have slipped my mind entirely. Then someone made a comment that triggered my rusty synapses, and I posted it on my Khanya blog here. It’s an Orthodox theological response to the penal substitution theory of the atonement. So it seems that penal substitution didn’t only slip out of my memory for a week or two, it slipped out of Technorati, and maybe out of the blogosphere generally, and maybe out of the universe! At the Land of Unlikeness we could think of no better way to break into Bulgakov’s Sophia thesis than to join forces with the rest of you and throw a Sergei Bulgakov Blog Conference to be held in September later this year. The details are still sketchy, but we already have a few participants and many others are pondering. More participation is welcome, both in the form of a 1500 word contribution or in the form of a response to a post. Please send your contribution ideas to The Land of Unlikeness. This looks as though it might be similar to a synchroblog, and on an interesting topic. In his aptly titled essay, “On the Holy Grail,” Sergei Bulgakov meditates on the meaning of the verse in John where Christ’s side is pierced with a spear and “blood and water flow out.” Bulgakov’s thesis is straightforward: It is not the legendary grail of Western mythos that is interesting or vital, but rather the fact that when Jesus spills his blood upon the earth, the earth is charged and changed and maintains the seeds of its own transfiguration even when Christ dies, descends, and ascends to heaven. Clearly, the church has always maintained that Christ is present in the Eucharist and in the Spirit which he bequeaths, but Bulgakov thinks that the fact that this presence resides also in the earth itself, which is the holy grail, needs to be thought about much more seriously. In a long and wide-ranging post the Ochlophobist looks at ecumenism from an Orthodox point of view. In an earlier post on the Emerging Church and Orthodoxy I pointed out the different views of ecclesiology that make “ecumenism” a controversial concept for Orthodox Christians. The Ochlophobist, however, looks at it much more widely: The Ochlophobist: real ecumenicic, augustinomianisms, there’s no such thing as the wicked witch of the west, or, we are all the wicked witch of the west, etc., part 2. When I taught missiology at the University of South Africa under the late Professor David Bosch he published his magnum opus, Transforming mission , in which he wrote about the “emerging ecumenical paradigm of mission”. Unfortunately his untimely death put an end to the discussion about this. But much of the emerging ecumenical paradigm seemed to be built on a Western paradigm, Western history and Western assumptions. The Ochlophobist questions many of these from and Orthodox point of view. We have many differences, but some of them are obviously compatible. Easterns hold crowns over the heads of bride and bridegroom at weddings, many Orientals hold crosses over the heads of bride and bridegroom. Both obviously mean the same thing – that the couple is called to martyrdom. Here we have a classic example of common Orthopraxis. The Oriental and Eastern Orthodox wedding services clearly mean the same thing. Christian wedding services from other traditions, in terms of both text and actions, seem to quite clearly mean something different. For reunion to take place, so say the Holy Elders, there must be acknowledgement of a unity of faith and of a common life. The acknowledgement of the unity of faith must happen among bishops, and among Orthodox and Oriental theologians, and it must happen among clergy and laity at local levels. I must experience as an Eastern Orthodox layman, the act of going to an Oriental church and hearing the same faith taught that is taught in the Eastern Church. The acknowledgement of a common life must come through the broad recognition among bishops, theologians, and the rest, that both Easterns and Orientals share the same intuition with regard to discipline, piety, and prayer. There are differences. The question is whether or not both sides come to understand and trust that the differences are semantic, as it were, and not substantial. With the Oriental Orthodox — the Copts, Armenians and Syrian Jacobites — the Orthopraxy is sufficiently similar, as in the wedding example, to make us feel at home in one another’s churches and services. Thouigh there are cultural differences, there is also much that seems familiar. It is not so much the Orthopraxy that is different, it is the Orthodoxy, and specifically the christology over the two natures of Christ. When it comes to Roman Catholics, and the thousands of Protestant groups, matters become more difficult. Some thirty years ago in South Africa a group of denominations in South Africa decided to commit unity. Anglicans, Methodists, Congregationalists and several varieties of Presbyterians were joined in the Church Unity Commission (CUC). And on one Sunday in 1974 they were all to get together locally and have a service of commitment to unity. I was then an Anglican, and in our area there were six congregations belonging to the CUC. The clergy of all of them got together to plan the unity service. It was agreed that it would be a Eucharist, and that it would be held in the Methodist Church and that we would use Anglican blotting paper for bread and Methodist furniture polish for wine. We would use Anglican chalices rather than dinky little Methodist glasses, and we would use the order of service provided by the CUC. Then began the fun: who gets to do what. We decided to put the names of the clergy into a hat, except that there wasn’t a hat, so we used the Anglican rector’s fondue pot (fondues were big in the 1970s, but I haven’t seen one for years). The Anglican rector’s name was pulled out for the celebrant, who would say the Eucharistic prayer. Sighs of relief from the Anglo-Catholics — it wasn’t going to be done by one of those heretics who lacked apostolic succession, so it might be a valid Eucharist. The Presbyterian pulled the intercessions. The Congregationalist objected, because everyone knew that the Presbyterian was charismatic, and that would give him licence to do weird stuff. The Congregationalist also didn’t like the fixed form of confession provided by the CUC. He didn’t want extemporary prayer from charismatic Presbyterians, but trusted himself with an extemporary confession. The Anglicans objected to that — how can you confess our sins? And so the discussion continued. And what this service of commitment to unity revealed was that we were far more divided than we thought we were. The Anglicans wanted an offertory procession (bringing up the bread and wine), but the Methodists and Presbyterians saw no need for it, so it was there in the beginning elegantly covered by a mosquito net. The Anglicans ended up consuming all the leftover Methodist furniture polish (vile stuff!) and the Methodists wondered why they didn’t just pour it down the drain. Compared with that, the question of crosses or crowns at the wedding service is a doddle. And just to show how effective the whole thing is, the CUC still exists three decades later, and there has been little progress towards unity. The whole ecumenism thing just showed how divided everyone was. So one really needs to ask what kind of ecumenical mission paradgim is emerging, and whether in fact there is one. A conservative blog for peace quotes, with apparent approval, an article that denounces communitarians as boring, bossy and fascist. 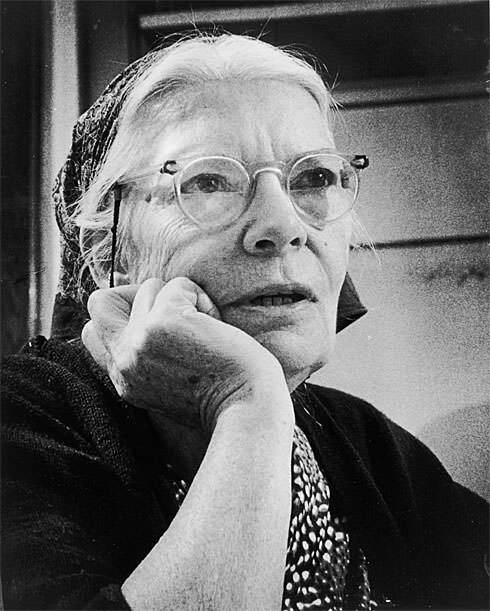 When I hear the word “communitarian” the first person who springs to mind is Dorothy Day of the Catholic Worker movement, and anyone less boring, bossy and fascist I cannot imagine. We are working for the Communitarian revolution to oppose both the rugged individualism of the capitalist era, and the collectivism of the Communist revolution. We are working for the Personalist revolution because we believe in the dignity of man, the temple of the Holy Ghost, so beloved by God that He sent His son to take upon Himself our sins and die an ignominious and disgraceful death for us. We are Personalists because we believe that man , a person, a creature of body and soul, is greater than the State, of which as an individual he is a part. We are personalists because we oppose the vesting of all authority in the hands of the state instead of in the hands of Christ the King. We are Personalists because we believe in free will, and not in the economic determinism of the Communist philosophy. If one sets aside the rather overblown rhetoric, this is not all that much different from the Zulu proverb frequently quoted as an example of ubuntu: “umuntu ungumuntu ngabantu” — a person is a person because of people. There have been a few reported cases of children who have been separated from their parents at an early age, and raised by wild animals, but in spite of the romantic legend of Romulus and Remus, such children usually find it very difficult to relate to other human beings, and are very deficient in personal development. The young fogey often advocates libertarianism, as does the author he quotes. As far as I have been able to ascertain, libertarianism is liberalism on steroids, and libertarians are liberals with attitude. In other words, libertarians have turned liberalism from a political idea for governing a country into an ideology and a complete worldview. I must admit, however, that Stanley Fish has attempted to turn liberalism into such an ideology. Even though I can see what he is getting at, I am in fundamental disagreement with his thesis. Liberals tend to see things in terms of practical politics, rather than a complete worldview. I was, briefly, a member of the Liberal Party of South Africa, at a time when its vision of a nonracial democratic South Africa was under extreme pressure from the government of the day. The Liberal Party had members of just about every racial and religious group in South Africa. Christians, Jews, Muslims, Hindus, pagans and Secular Humanists joined together in a common enterprise. Their theology and their anthropology, their understandings of human nature, may have been very different, but in spite of the differences, they were able to join in a common political vision of the kind of society they wanted South Africa to be — with freedom, justice, the rule of law, and a nonracial democracy in which all citizens would have a say in the government of the country. 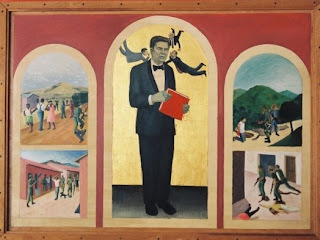 Libertaranism, on the other hand, if I have correctly understood the article cited by the Young Fogey, seeks to impose a much wider worldview, and one that, as far as I can see, is essentially antithetical to a Christian one, in many ways as much so as the Communist worldview. It is based on a view of man that is fundamentally at odds with Orthodox Christian anthropology. As Christians we have a model, the Holy Trinity, which is neither individualist nor collectivist. The persons of the Holy Trinity are neither three individuals, nor a collective. But libertarianism begins to look like a heresy.